A well-documented content strategy has been found by the Content Marketing Institute to be a key factor in the success levels of B2B companies who are effective at content marketing. However, in this year’s B2B Content Marketing Benchmarks, Budgets and Trends research, only 32% of companies questioned have a documented content strategy, and overall 55% of B2B companies are unclear just what content marketing success or effectiveness looks like – despite the fact that 88% of those companies are using content marketing to some degree. B2B marketers who have a documented content marketing strategy get better results from their content marketing tactics, social media platforms, and paid methods of content distribution (i.e. they rate them as more effective when compared with their peers who don’t have a documented strategy). Why is a documented content strategy important? The main value of going through the process of documenting your content strategy is that it enables you to articulate a clear and considered digital direction for your business that states exactly what you are intending to do. By sharing your strategy internally with stakeholders and externally with suppliers you can be sure that everyone involved is pulling in the same direction. This allows you to align people, plans and execution in a single determined direction, increasing your momentum and chances of success. When you add measurement and regular progress checks against execution, you can be sure that your documented content strategy will take you forward efficiently to achieving your goals with success. What does a documented content strategy look like? There is no set standard way to document your strategy, and it will depend very much on your particular business and your goals as to knowing the right questions to ask. You will want to start with articulating the challenges you are planning to solve for your customers, the results you are looking for, and the amount you are prepared to spend on achieving these results. You should have a very good idea of your ideal customer, who they are, what their issues are, what their buying cycle looks like and how you can support them through every step of your sales funnel. You should include some views on what your competition is doing and where they are successful as well as using this exercise to explore potential gaps in the market where you can step in. You will need to determine what you are planning to say, in what tone of voice and ways to establish your uniqueness in your marketplace. Including an audit of existing content and any successes you are currently having will allow you to offer a stop/start/continue view of which channels and which types of content will support your strategy. You will need to outline governance and processes that will need to be tweaked or established to support your strategy. You may also need to identify or recruit key staff or agencies who will support your in-house team in content creation and distribution. There may be a need for development of templates alongside standards and usage policies that will need to be trained in to relevant staff. And you will need to establish what success will look like for you – how will you measure your overall success, and also how will you evaluate how successful each aspect of your strategy has been. What do I do with my documented content strategy now? Your strategy document should be a living document that is reviewed regularly and amended according to your successes or failures in execution, and in response to changing market or customer needs. The document itself should be shared as widely as is needed to ensure continued buy-in to your plans from stakeholders, content creators and management, to ensure everyone understands and can support your direction. It will be the principal feed into your editorial calendar and process development, and so will be the driver behind your setting up of these critical stages of execution. If you would like to discuss your readiness in establishing a documented content strategy, or if you need support in articulating or executing against your strategy, please get in touch with us on 01491 614404, or email us at info@marketingondemand.co.uk and see how we can help. 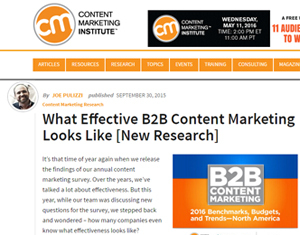 Content marketing focus 2015: how can we help you? Is your company ready for these 2016 digital trends?